The National and Kapodistrian University of Athens is the oldest higher education institution in Greece. It was founded in 1837, at which time it was the only university in the Balkans. Its full name is only used for certain official purposes. In informal settings, the organization is generally referred to as simply the University of Athens. The university’s oldest buildings still stand to the north of the Acropolis hill, although most of its operations are now located elsewhere. The university has approximately 80,000 students. The university was originally called the Othonian University after King Otto, the ruler of Greece at the time of the institution’s creation. Sometime later, it was renamed in honor of Ioannis Kapodistrias, the man who was the first ruler of independent Greece. In its early days, the university consisted of just four faculties. These were the school of arts, medicine, law, and theology. Subjects such as mathematics and sciences fell under the arts category. In 1904, the first substantial reorganization of the university took place, with a new science faculty being created. The schools of mathematics, pharmacy, and physics formed its three components. Chemistry was eventually added to the list of schools in 1919. A few years later, the previously semi-independent dentistry school was subsumed into the medical faculty. A new suburban campus at Ilissia was built in the 1960s to house sciences, theology, and philosophy. At its opening, the university had barely 50 students, although there were already more than 30 professors. The student population rapidly increased and by the beginning of the 20th century around 1,000 students were attending annually. Concerns about the academic ability of some of each year’s class led to the introduction of entrance exams in the late 1920’s. In the 1950’s, a further element of quality control was added when the country’s education ministry began to set a quota for the university’s student intake. Life sciences are housed at Goudi, while those subjects relating to sports and physical education are at Daphne. A number of other faculties and departments, including those dealing with law, economics, and education, have their homes in a variety of buildings scattered across central Athens. 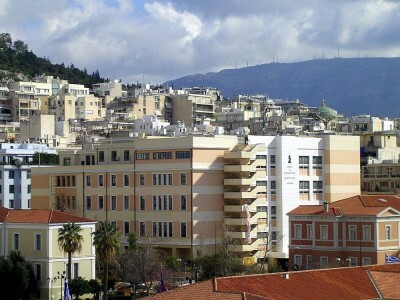 The university is among the most prestigious research institutions in Greece, and work is carried out in association with a large number of other bodies. These include the country’s foundations and institutes for research, the capital’s national observatory, a number of foundations and institutes specializing in aspects of medicine, and the Greek branch of the Pasteur Institute. By some measures, more than half the scientific research produced in Greece each year originates from the university.